Hanoi (VNA) – A workshop was held in Hanoi on March 22 to seek ways to improve the institutional framework for e-identification and e-authentication in e-government development towards a digital government and economy in Vietnam. The event was co-organised by the Vietnamese Government’s Office, the Ministry of Information and Communications, the World Bank, and the Australia Agency for International Development. Participants shared effective models which are being carried out in some countries such as Estonia, Singapore, Thailand, and Denmark, and talked about challenges during the implementation process. Minister and Chairman of the Government’s Office Mai Tien Dung said e-identification and e-authentication in e-government building is important to the reliability of e-transactions, especially online public services. He said nearly one billion people globally lack identification while the remaining 6.6 billion people have some form of identification but more than half of the identification forms cannot be used effectively in the today’s digital ecosystem. He pointed to the fact in Vietnam that individuals and organisations have many codes such as health insurance codes, social insurance codes, tax codes, and bank deposit codes. In absence of a national database on population, the Prime Minister has requested domestic and foreign experts to devise ways to authenticate identification using these codes as soon as possible. According to Dung, most public services portals and information systems in Vietnam still use accounts and passwords to authenticate identification of users, which does not ensure accuracy. 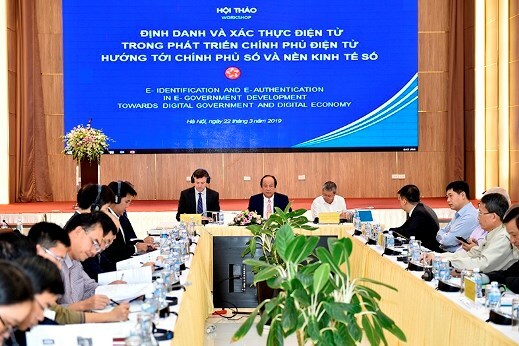 He said Vietnam is building institutions to ensure the confidentiality of personal information, connection, sharing, identification and authentication as well as information security during the process of transaction. The country launched the National E-Document Exchange Platform on March 12. The national public service portal will be launched in the fourth quarter of this year.